Ivan Britzin was one of Fabergé's notable competitors.Trained by Fabergé, Brtizin closely followed his master's style, and focused, in his later years, on frames, cases and smaller objets de vertu. 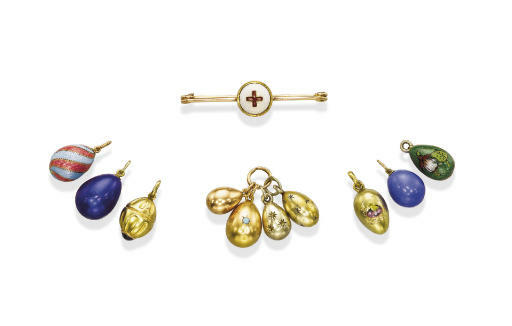 After the outbreak of World War I, the Red Cross motif became a favourite on Russian jewels, employed both by Fabergé and other jewellers, such as Britzin, on enamelled eggs and small jewels. The reference was to the support and dedication of Empress Alexandrovna Feodorovna for the Russian Red Cross, who, as their patron, presented these jewels to her colleagues.